How is climate change impacting the global wine industry? How can we make the best of it? What can we do before it’s too late? It’s a field of research that barely existed when Jones began to dig into it two decades ago. Since then, he’s dedicated his career to focusing on the entire climate puzzle for winegrape production, from defining what the climate is in a particular place to what cultivars will thrive there, and, of course, the outcome of all of this: the wine that’s produced from a less mysterious terroir. Jones’ groundbreaking work is not just theoretical science or academic ponderings. It brings awareness and informs hands-in-the-soil decision makers here and around the world, and has changed the way government officials view the climate crisis and chart the future. His understanding of the big picture of global climatology benefits everyone, from large commercial grape growers to the smallest hobby farmer. For them, Jones spends many lab hours and field time to provide reliable information on site and climate characteristics that translates into better decisions by growers, which increases grape and wine quality and, ultimately, sales. And he does it all with a quiet enthusiasm. No one has ever heard him brag, even after he was named to the U.K.-published Decanter magazine’s “2009 Power List” of the 50 most influential people in the wine world. Locally, he’s credited with enhancing the quality and reputation of Southern Oregon wine. “If part of the result of my work is that the region grows, gains recognition as a fine wine-producing region and people are successful, then I have succeeded in being a scientist,” Jones said, modestly. These, of course, are remarkable accomplishments and good reason to name Jones the Oregon Wine Press 2009 Person of the Year. But there is one fact Jones hesitates to tell and yet it is an accomplishment that this renowned academic should brag about: He didn’t finish high school until he was in his late 20s, after enjoying several lucrative careers. This former chef and entrepreneur now spends rainy days in vineyards collecting data on climate, landscapes, soils and cultivars, and nights sharing his research with scientists, industry insiders and most important, muddy-handed growers, all to boost Oregon’s growing wine industry. “It’s been an interesting path to where I am today, that’s for sure,” Jones said. It was a winding journey, by way of seven other states, before Jones landed in Ashland in 1997 with his wife, Liz. His father, Earl Jones, a dermatologist at the time, suggested that Jones go back to school. Greg did, first by passing the GED, then earning a B.A. and Ph.D at the University of Virginia, which was founded by another wine enthusiast, Thomas Jefferson. Originally, Greg wanted to study hydrology, but shifted to climatology to better explore how weather and climate influence agriculture. During this time, Earl asked his budding scientist son a seemingly simple question: Where’s a good place to grow Spanish grapes on the West Coast? Earl wanted to produce wines from grapes he’d grow. With some guidance from his son, he landed in Roseburg in the early 1990s and began what’s now the highly regarded Abacela Vineyard & Winery. At the time, no scientist was known to be looking at viticulture in depth and only a few viticulturists were analyzing climate comprehensively from a climate scientist’s perspective. “I married the two of them and began telling an important story about the research that needed to be done,” Greg explained. He spent years huddled over reference books and scientific studies, and compiled research for his dissertation on the climatology of viticulture in Bordeaux, France. Jones’ research is now in libraries all over the world and is used by people whose families have been growing grapes for centuries. “Professor Gregory Jones is the greatest and best connoisseur and historian of vine quality in the world,” said Emmanuel Le Roy Ladurie, a professor at the University of Paris and a famous wine historian and author. From the beginning, Jones has served the role of a unifying scientist. He continues this by collaborating with people working in other wine regions, facilitating parallel research projects and finding ways to get the information out. SOUTHERN OREGON VINES BEFORE GREG JONES? When Jones accepted the position as a professor in SOU’s Department of Geography (what is now the Department of Environmental Studies) in 1997, the region had a more-limited, less-defined wine scene. There were about 120 growers in what would later be designated, with Jones’ help, as the Southern Oregon AVA. “Most growers were concentrating on a mix of varieties that did not fully capture the region’s diversity and potential,” Jones said. Oregon State University Professor Porter Lombard conducted grape variety trials at the OSU Experimental Station in Central Point in the 1970s and ’80s. When he retired, it ended most of the local ongoing research until Jones stepped in. Jones discovered through his analysis of existing sites, climatic conditions and the length of the grape-growing season that the region could support a broader range of varietals. “I would say that much of my research has been about bringing awareness of what growers have done historically, what varieties do best and where, and how all of this relates to other wine regions worldwide,” he said. Don and Traute Moore were typical growers at the time. Don, a retired internist, and his wife had moved to Southern Oregon in 1990 to plant what would become the expansive Quail Run Vineyards. Years into their project, they attended one of Jones’ popular lectures. They stayed after the talk to get more specifics from the serious-looking scientist. Emboldened by Jones’ credentials and exacting data, the Moores decided to shift their focus from Pinot, Chardonnay and Riesling grapes to warmer weather Merlot, Syrah and Viognier. Then they planted even later-ripening grapes—Cabernet Franc, Cabernet Sauvignon, Grenache, Mourvedre and Petite Sirah—all with considerable success. Today, the Moores farm 22 varietals that have been specifically matched to sites in the Bear Creek Valley. Since Jones arrived, the number of vineyards in Southern Oregon has increased to more than 200, the area planted to more than 3,000 acres, producing more than 6,000 tons of fruit with a total crop value of $5 to $6 million, according to recent reports. The biggest differences in the last 13 years, however, have been the wider diversity of grapes grown here and the recognition that the wines have garnered. Again, many experts credit Jones for helping to expand the region’s offerings and reputation. The SOU professor has been quoted in so many books, scientific journals and consumer articles that he’s lost count. He continues to present his original research at global conferences. And when he travels, which he does often, he brings along wine produced here and then has the best palates of France, Italy, Spain and Portugal test the complexity of this New World wine region. This wine scientist has a lot on his 2010 to-do list. In his personal life, he plans to go camping and traveling with his wife, Liz, and their 10-year-old twins, Adam and Curtis. And he’d like to fix the roof on his Ashland home. Professionally, this year’s main goal is to finish a book on Oregon’s terroir begun by the late OSU Professor George Moore. The book, which is more than halfway completed, will detail Oregon’s landscape, climate, soils and the history of grape growing from 1800s to today. To do so, other projects around the world—Canada, Italy, Hungary, Australia, South Africa and New Zealand—will have to wait. Jones has already traveled to most of the world’s major wine regions—“something I would have never dreamed possible 15 years ago,” he said. He was in Portugal in November 2009, giving the keynote speech at the Iberian conference on viticulture and enology and working with a government-industry organization to better characterize the country’s centuries-old winemaking terroir. He makes his travel plans around his family and teaching time. “Most of it is a management and planning issue, which I am fairly good at,” he said. This year, his speaking and research collaboration schedule leads him to Paris in January, New York in February, Washington D.C. in April, Brazil in May, Italy in June, France in July and Portugal in August. 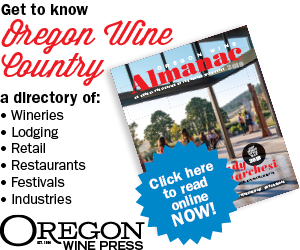 In between, he’ll be at the Oregon Wine Industry Symposium in Eugene in February, representing Oregon. Otherwise, he’ll be in his SOU office, quietly changing the world of wine. Janet Eastman is an Ashland-based journalist who covers Southern Oregon wine for Examiner.com and other media. “When he began pursuing his Ph.D. at the University of Virginia, Greg noted (correctly) that our level of sophistication in understanding climate and climate variability had not yet translated to the global wine industry. This was odd, especially given the importance of yearly climate variations in influencing vintage quality and production. In the process of pursuing this research over the past 10 to 15 years, Greg has brought a level of advanced understanding of climate to the wine industry and, in the process, has become one of the global leaders in this issue.